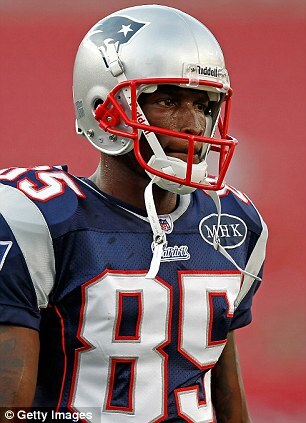 Nobody really wants to be upstaged in the bedroom but it seems that's exactly what happened to the New England Patriots's wide receiver Chad Ochocinco. 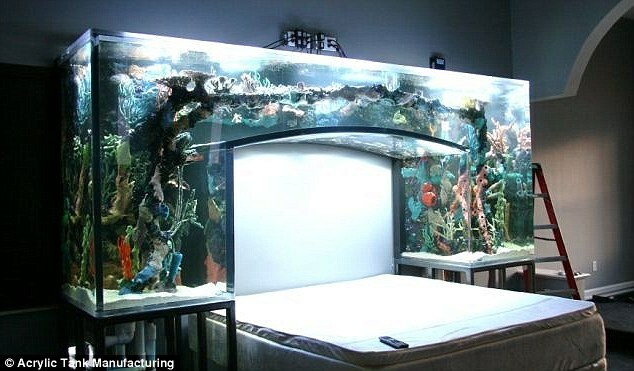 Since he had an amazing fish tank installed in his bedroom in his Florida mansion, he says fiancee Evelyn Lozada cant stop looking at it. Evelyn, who became a known face on the TV show Basketball Wives because of her previous engagement to ex-Celtic Antoine Walker, 'stares at these damn fish every time before bed,' Chad says. But it's easy to see the fascination. The unique aquarium was created by Wayde King and Brett Raymer, the stars of the new hit reality show Tanked on Animal Planet. Their ATM (Acrylic Tank Manufacturing) company is the largest aquarium manufacturer in the United States. The show, airs at 9pm Fridays on Animal Planet, features the brothers-in-law as they create fish tanks in all shapes and sizes for everything from casinos to fast food restaurants.King and Raymer told Boston Herald's Inside Track. But building Chad’s tanks wasn’t all work and no play. Both of them are football fans so they loved having the chance to hang out with Ochocinco for a couple of days while they did the installation. 'He was cool as heck,' said King. 'We hung on the couch, talked about going out, sports, and he let me take pictures in front of his Lamborghini. They also built an oversized tank for Chad’s TV room with enough room for three full-size flat screen TVs to hang on the front. 'He’s way more outspoken in front of the camera than he is in person,' Wayde and Brett told the Boston Herald. In addition to Chad’s bachelor pad, Brett and Wayde have created custom tanks for everyone from director Steven Spielberg to rapper Dr Dre. They have built fish cribs in the shape of pyramids, phone booths, cars, kegs and even the female anatomy. 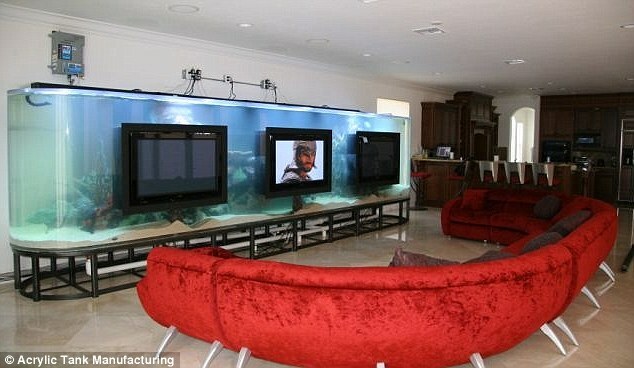 So when they started creating fish tanks, did they expect to end up as big time reality TV stars? 'I told Wayde five years ago when we came up with the idea for the show ... we’d be on Animal Planet or Disney,' Brett said.